AVCHD videos are normally produced by camcorders like Canon, Sony, Panasonic, JVC, etc. in the MPEG-4 AVC/H.264 video compression codec. If you only want to play AVCHD videos on your Mac computer, you could make use of VLC player. But if you want to edit camcorder recorded AVCHD videos in iMovie or Final Cut Pro, you need to convert AVCHD to MOV or MP4 as these editors don’t accept AVCHD videos. MOV is more common than MP4 on Mac. In this post, you will learn how to convert AVCHD to MOV on Mac with an AVCHD to MOV converter for Mac. 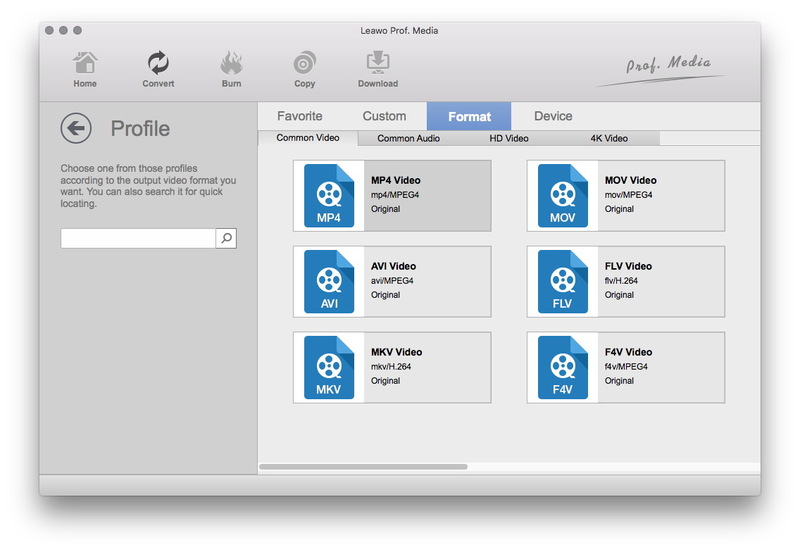 Part 3: How to Convert AVCHD to MOV on Mac with Leawo Video Converter? In this part, a free AVCHD to MOV converter for Mac is introduced for you to convert AVCHD to MOV Mac. Let’s take a look. MacX Free AVCHD Video Converter is a powerful free AVCHD video converter, which is developed for Mac users to convert AVCHD on mac or edit AVCHD video. It can free convert video from AVCHD to MP4, MOV, AVI, iPad, iPod, iPhone, etc for Mac with perfect output quality and high conversion speed. This versatile Mac AVCHD video converter has powerful editing functions to polish your videos. MacX Free AVCHD Video Converter allows you to make some editing and decoration for the output. You can adjust video/audio settings, trim video or audio pieces, cut off the unwanted part of the video and other beyond your imagination for individual needs. With the Mac AVCHD converter, you can easily enjoy high definition video on your Mac, iPad, iPhone, iPod, Apple TV and Blackberry. 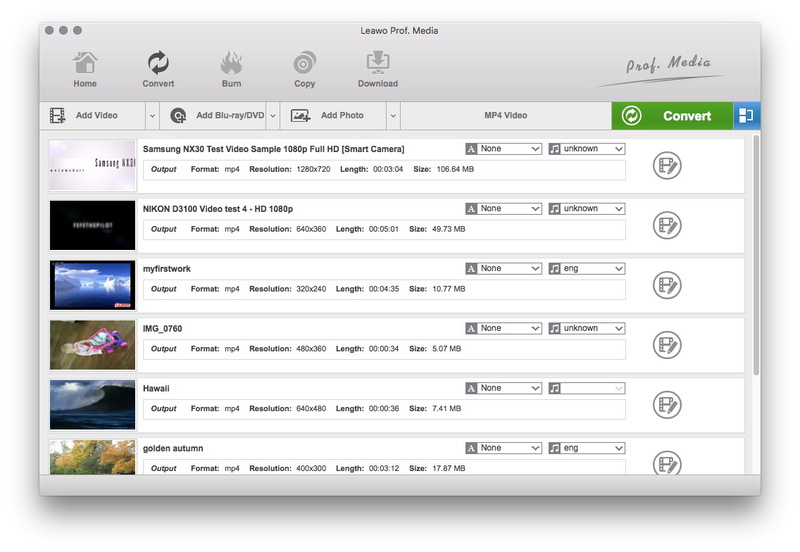 Leawo Video Converter for Mac is a fairly wonderful Mac AVCHD to MOV converter to help Mac users easily convert AVCHD videos to MOV format on iMac or Macbook within only a few clicks. It could work on Mac OS 10.6 and later, including the latest Mavericks. Actually, Leawo Video Converter for Mac handles all kinds of video conversions on Mac, like MOV to MP4, FLV to MP4, MKV to MOV, AVI to M4V, etc. 1. This video converter can import video and audio sources in any formats, and realize mutual conversion between them with ease. You can get movies, songs and more in formats of sorts for enjoying. 2. It is the best video converter to convert 2D video to 3D with 6 different 3D effects available: Red/Cyan, Red/Green, Red/Blue, Blue/Yellow, Interleaved, Side by Side. 3D Depth is adjustable as well. 3. The video converter could convert video and audio for Apple/Android/BlackBerry/Windows Mobile/Symbian/Palm users, and more device/player/software users. 4. This video converter supports video-folder reading for batch files loading, and batch conversion feature. You can fulfill video conversion within a few simple mouse-clicks. 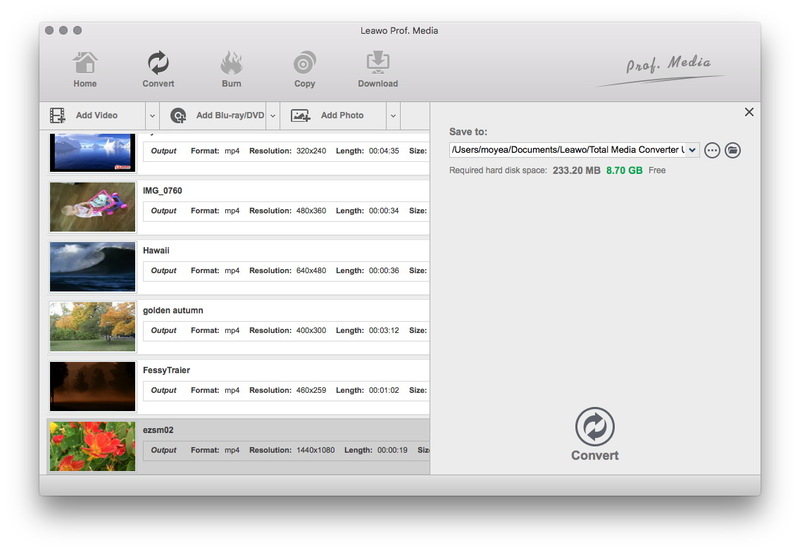 Part 3: How to Convert AVCHD to MOV on Mac with Leawo Video Converter for Mac? First of all, you should transfer recorded AVCHD video files from your camcorder to your Mac computer. 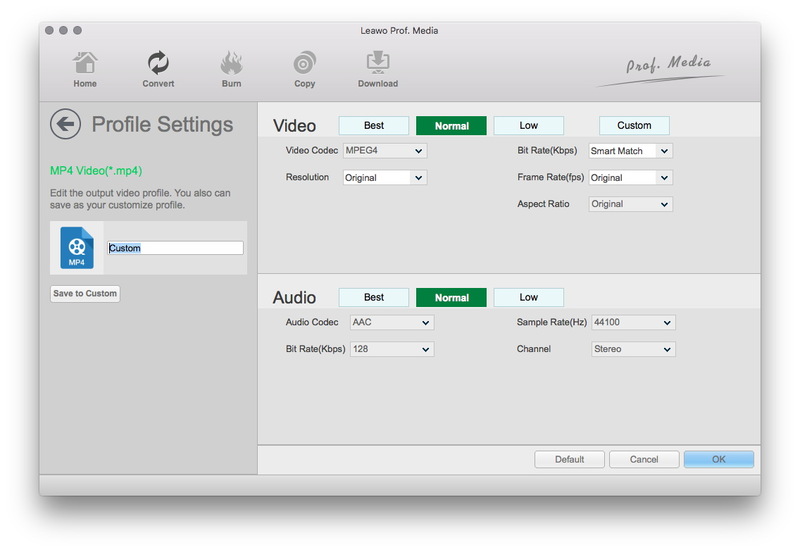 Then you need to download and install Leawo Video Converter for Mac on your Mac computer. Finally, kick off this AVCHD to MOV converter for Mac to enter the main interface and follow the guide below to learn how to convert AVCHD to MOV on Mac. Under the “Convert” module, click the “Add Video” button or directlry drag source AVCHD video files that you’ve stored on your Mac into this AVCHD to MOV converter for Mac. You could get all information on the left processing list, import multiple AVCHD video files for batch AVCHD to MOV conversion, edit loaded AVCHD video files, add 3D effect, etc. After importing source AVCHD files, click the drop-down box right before the big green “Convert” button and then select “Change” option on the drop-down panel to enter the Profile window for output format setting. Open “Format > Common Video” group to select MOV as output format. Optional: If you’re not satisfied with the video and audio parameters of preset MOV format like video codec, bit rate, aspect ratio, quality, frame rate, audio codec, audio quality, audio bit rate, sample rate and channel, you could reset them. After setting output format, re-open the drop-down box and then select “Edit” option to enter the Profile Settings panel. On the Profile Setting panel, you could freely set the parameters. Finally, click the bottom “Convert” button of the sidebar to start to convert AVCHD to MOV Mac. After conversion, you could easily transfer the converted AVCHD videos (now in MOV format) to QuickTime, iMovie, FCP, iPhone, iPad, etc. for unlimited playback or editing. Note: Windows users should switch to this program’s Windows counterpart Leawo Video Converter to convert AVCHD to MOV on Windows.